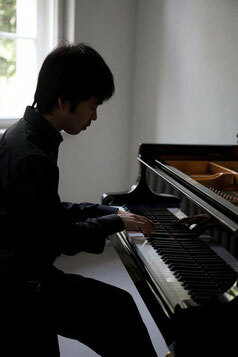 Born in Sendai, Japan, Yuya Tsuda has won numerous prizes and awards, and performs regularly as both soloist and chamber musician throughout Japan and Germany. Yuya Tsuda is an Associate Professor at the Tokyo University of the Arts. Yuya Tsuda entered the Tokyo University of the Arts in 2001, and won 3rd prize at The Music Competition of Japan in the same year. Graduating from the Tokyo University of the Arts with top honors, he received many prestigious Awards such as the Ataka Award, Acanthus Award, and the Kreutzer Award. He went on to study at the Berlin University of the Arts, where he gained Diploma and Konzertexamen. He has won many international prizes including 1st prize, the audience prize, and the French Ambassador to Japan Prize at the Sendai International Music Competition in 2007, and Special Prize for the interpretation of commissioned work at the ARD Wettbewerb München in 2011. Yuya Tsuda founded the piano trio "Accord" together with violinist Kei Shirai and cellist Hiroki Kadowaki and they perform actively throughout Japan. As a chamber musician, he has performed with many renowed musicians such as Yuzuko Horigome, Roger Chase, Charles Neidich, Gerard Poulet, Jens Peter Maintz. The Orchestras he has performed with include Berliner Symphoniker, Deutsches Kammerorchester, Münchener Kammerorchester, Tokyo Philharmonic Orchestra, Japan Philharmonic Orchestra, Sendai Philharmonic Orchestra, Nagoya Philharmonic Orchestra　and Hiroshima Symphonic Orchestra. His teachers include Pascal Devoyon, Gabriel Tacchino, Miyoko Goldberg Yamane, Yu Kakuno, and Ruriko Shibuya.